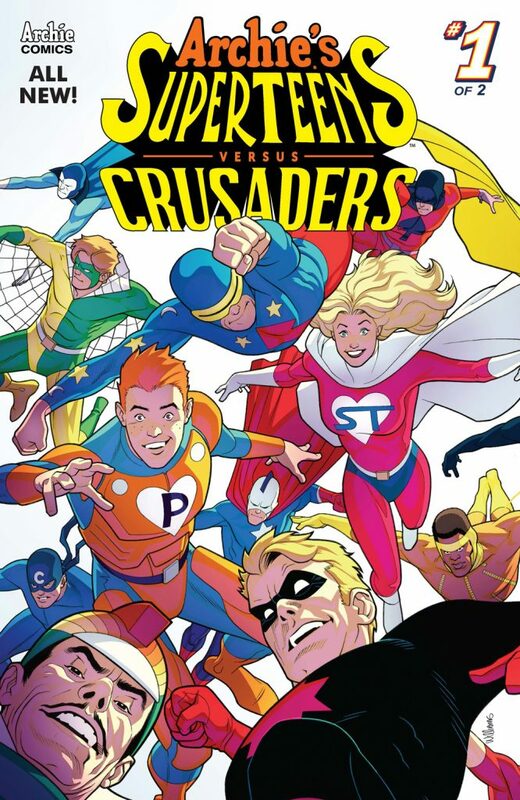 THIS REVIEW OF ‘ARCHIE’S SUPERTEENS VS. CRUSADERS’ CONTAINS MINOR SPOILERS. By Clyde Hall. “A dream you dream alone is only a dream. A dream you dream together is reality.” The Yoko Ono observation, quoted by John Lennon in December 1980, may help explain how the dream and fantasy sequences of Archie Andrews and Betty Cooper as superheroes soon became its own mini-continuity. High sales didn’t hurt, either, after those initial 1960s ‘What If?’ appearances of Pureheart the Powerful (later Captain Pureheart, now simply Pureheart) and Superteen. The duo, along with Jughead’s Captain Hero, returned in the 1990s with their shared hallucination/alternate universe superheroic adventures as the Superteens. Finally! A group named after a female member! Take that, ‘Mr. Fantastic’! 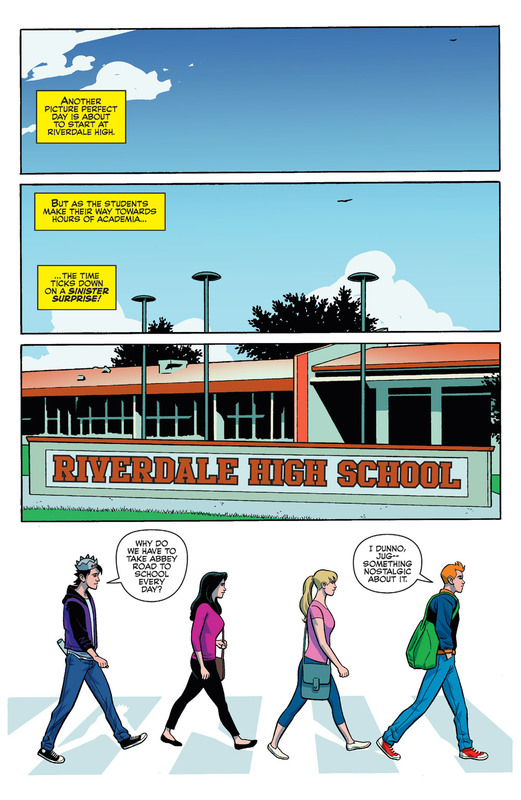 Now, on the wave of Archie Comics’ successful re-imaginings of their erstwhile Riverdale teens into varieties of alternate continuities, a day came. 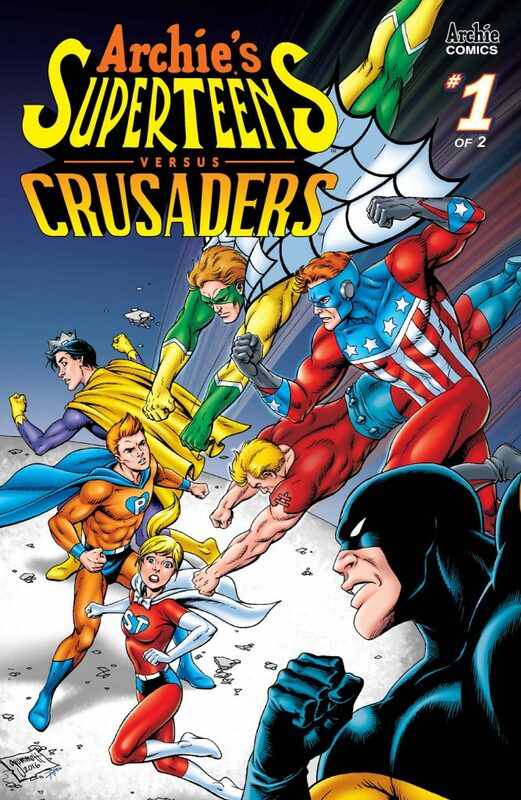 A day unlike any other, when a threat arose that proved impervious to the humorous repartee of Archie and his pals, requiring a meeting of the Superteens and the Mighty Crusaders! The only question was the tone it would take. The first issue answers that up front. 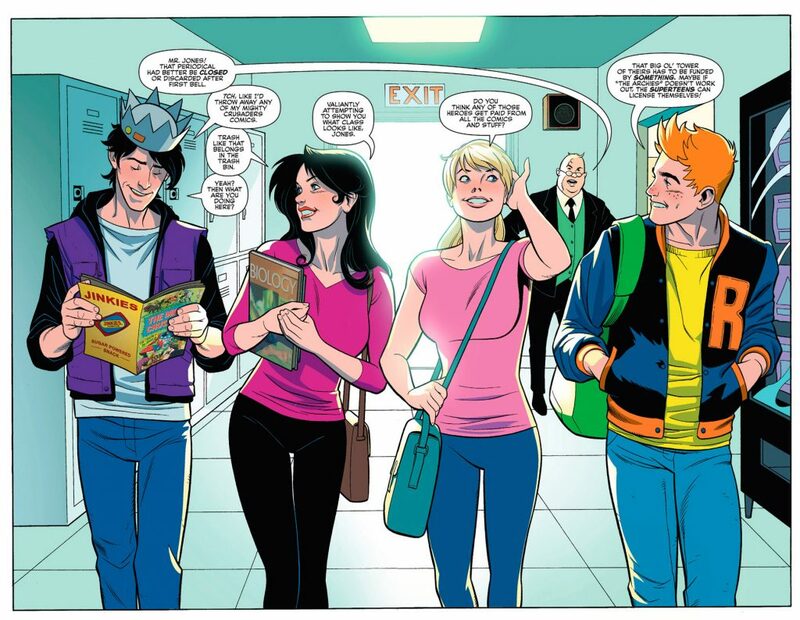 Scribes Ian Flynn, David Williams, and Gary Martin waste no time gracing the pages with nostalgic fondness and pitch-perfection Archie cast banter. They’re out to have maximum possible fun, and the readers are invited along for the party. Not the endearing yet cut-n-paste humor and gags of the meta-Riverdalians’ original appearances, but smart and amusing witticism with scintillating visuals. 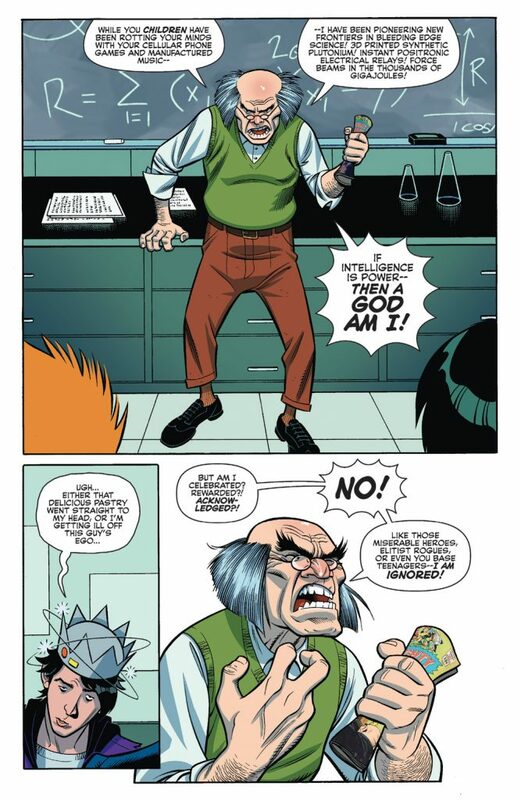 Substitute teachers in high school are at best controllable and at worst—well, for Archie and the gang, the worst is finding theirs has a PhD in Mad Science and is conducting a crash course in Supervillainy 101. This leads to delicious monologuing and scenery-nomming by the vile Doctor Zardox. As evil plans unfurl and destruction begins, one member of the Crusaders arrives to assess the situation. More Crusaders are called in, but danger escalates. 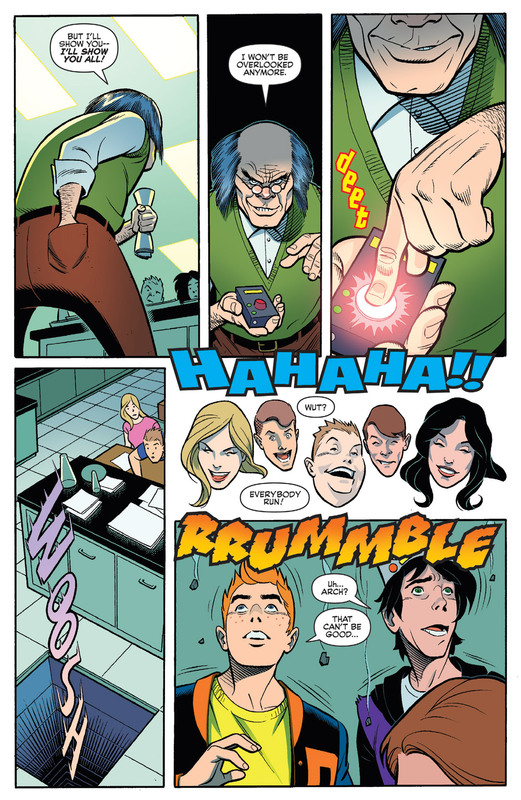 With the destruction of Riverdale imminent (more importantly, destruction of Riverdale High, dooming students to assured summer classes), and after a crushing personal loss for one of the Archies, the teens are compelled to stop their teacher’s rampaging Zar-Bot as the Superteens. 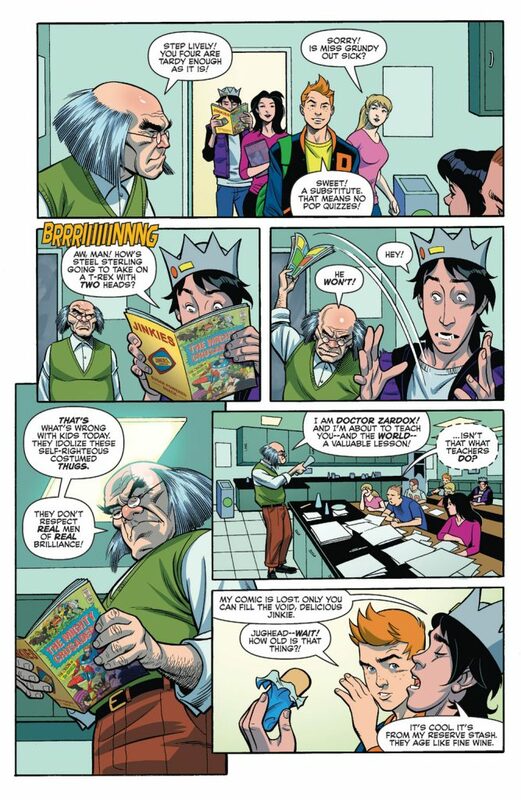 Issue #1 not only takes a fresh approach to a previous Archie-nate Reality without reinventing it, it surpasses the original in most respects. It also satirizes the superhero genre without mocking the Mighty Crusaders who, by all appearances, are a blend of the originals and members of 2017’s Dark Circle lineup. The art by Kelsey Shannon, David Williams, and Gary Martin is clean, smooth, and attractive whether depicting an action sequence or a gag salvo with mirthful expressions. On the negative side, for a 2-issue special, it’s Crusader-lite. While they look to be center-stage next issue, it’s hard to envision the Superteens getting enough panel time to strike a balance meriting the title’s promise of a meeting or clash of the two groups. But the creative team are the heroes of the first issue, and we can believe in them to prevail against all odds for the second act. Just as the campy material their work is based on sought to provide a carefree, temporary diversion from tense realities of the 1960s, they’ve offered a quality buoy of fun as relief from our modern times. Both their timing and their execution is exceptional. Written by Ian Flynn, David Williams, Gary Martin. Art by Kelsey Shannon, David Williams, Gary Martin. Check out this six-page preview of ‘Archie’s Superteens vs. Crusaders’ #1, courtesy of Archie Comics!